My son, the Eagle Scout, is in his late 20s now, but I can only imagine how he’d have been the toast of his troop 10 years ago if he’d showed up at camp with an Off Grid Tools’ survival axe. This cool little multi-tool weighs about 1 ½ pounds, and at 11 inches long, it’s small enough to carry on your belt or in your toolbox. It has so many uses that it would have probably gotten worn out during a weekend camping trip — except that it’s way too tough. The base tool is a stainless-steel hatchet, but that just gets things started. Off Grid lists 31 different features, including the hatchet blade, a hammer head, nail claw, pry bar, a 6-inch reciprocal saw blade hidden in the handle, a handful of hex sockets, a cutting blade, a gas valve wrench, bottle opener and a hardened-steel glass breaker. I understand the survival axe would be a must for off-road camping, and with wood to cut and tent pegs to drive in the ground, it’s a winner in that regard. But I love the idea of all the additional uses I could come up with for the hunting camp, several of them involving the rough butchering of deer or other big-game animals. I’m sure I could think up more — just maybe not 31. 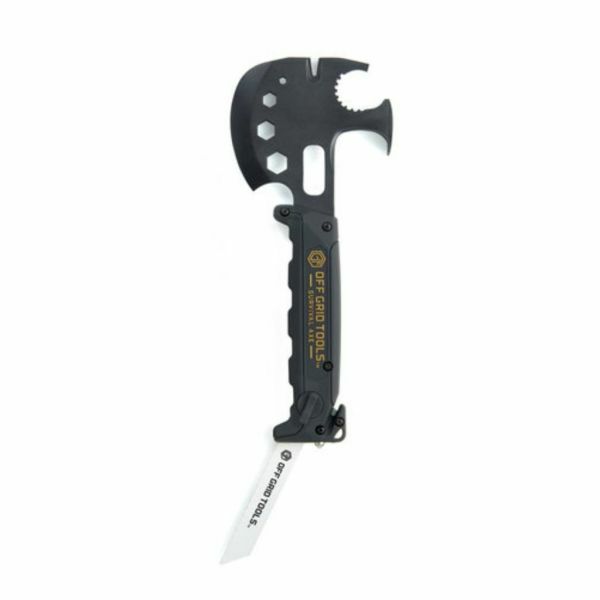 The MSRP for the survival axe is $39.99.